I’ve never made socks before, probably as I’m not a big fan of knitting on four needles, but within the knitting circle I see many people who are avid fans of the home made sock. So I shouldn’t have been surprised when, towards the end of last year, I had a sudden fascination with learning how to knit them. I do have very early memories of seeing a wooden sock darning tool at my gran’s house and I was told by my mum that she and my grand-parents had all made them in the past. 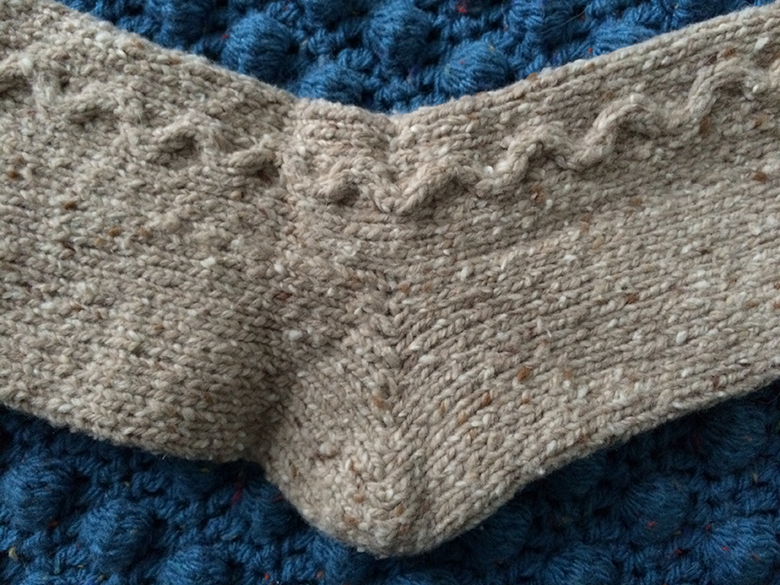 I just hoped I had picked up the sock-knitting gene – and I think I have! 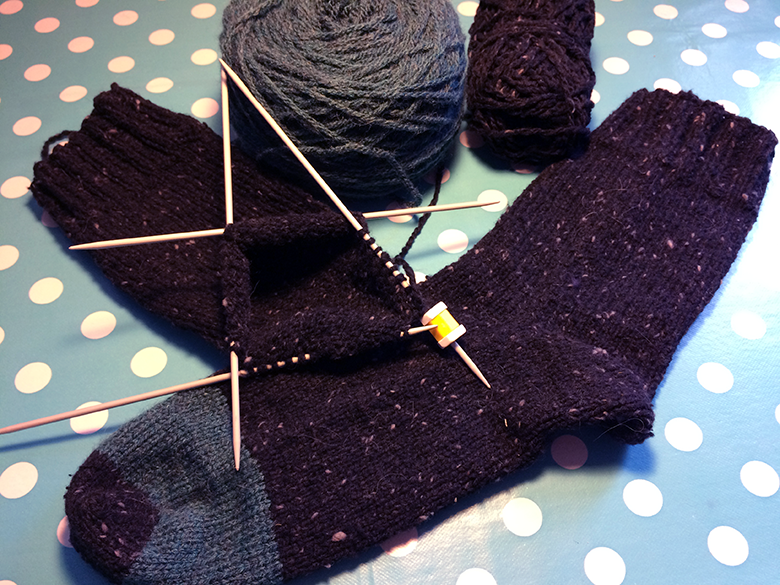 As it was winter I had decided to make thick boot socks that would keep my (normally cold) feet toasty warm. Deciding on what wool to use was easy as I’d already bought two 50g balls of Patons Soft Tweed, from the bargain basket in my local wool shop, that were crying out for a project. The yarn was 50% wool and knitted up to an aran pattern, so not only would these be warm but also quick to make. I began to look for sock patterns, which was more of a challenge than I had expected; so many different styles and techniques to choose from. In the end I took the basic elements from different patterns and combined them, with a bit of free-styling, to create my first pair in raspberry. 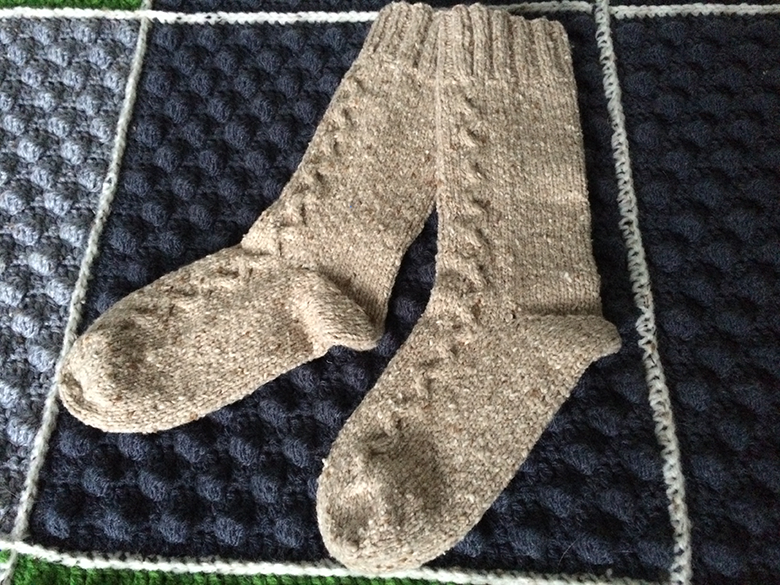 The main body of the sock was knitted in stocking stitch and I used the short-row heel method for the heel and Kitchener stitch for the toes. There are some excellent tutorials on YouTube that clearly show what the techniques look like and how to do them. This time I wanted to add a slight pattern down the front. Using a cable needle (in addition to the four knitting needles) I did get into a bit of a pickle at first until I got the hang of it. This was my attempt at a cable pattern but as you can see it turned into more of a squiggle than a cable – but I still like it. 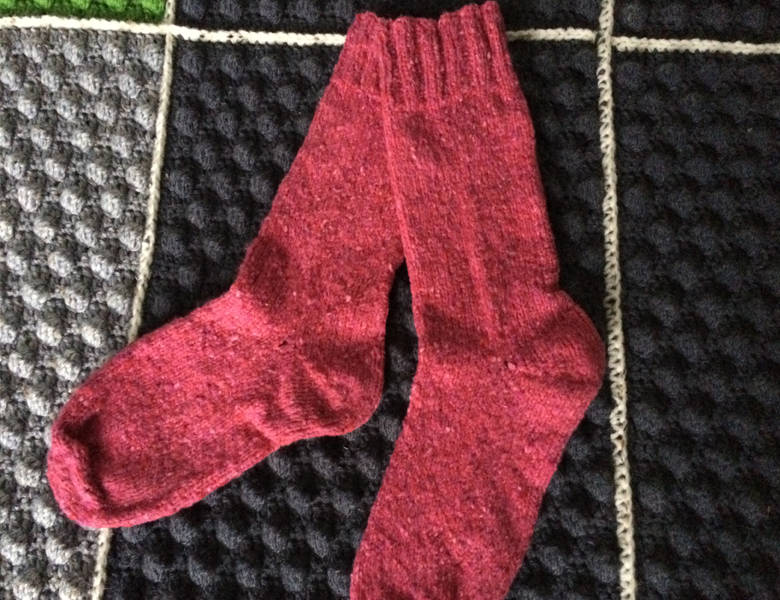 Having used the same wool and needle size as the raspberry socks I was surprised to find that these turned out much smaller. 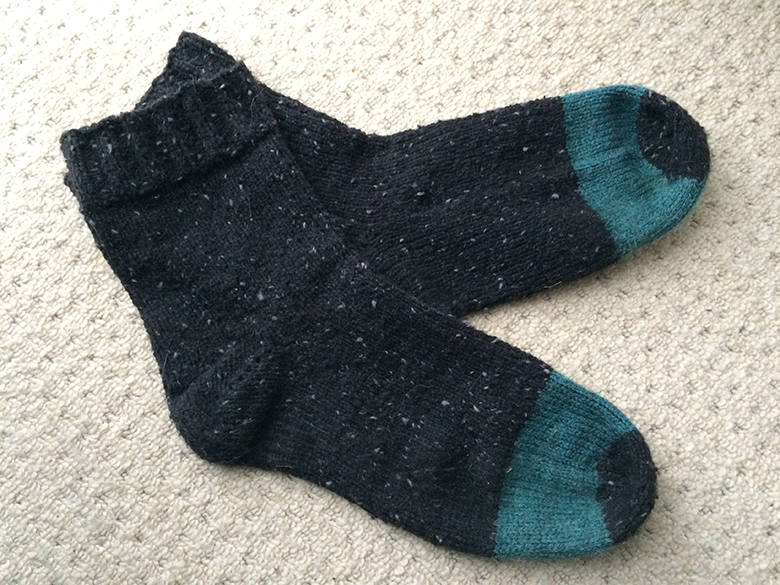 Apparently the cable pattern reduces the overall width of the sock – a little nugget of information that I only discovered once I had finished them! Fortunately, as my mum has smaller feet than I do, she has gained herself a pair of socks. The lesson I learned from this project is that 50g of wool is not enough to make a size 10 sock. I thought of a few solutions but I opted to add a stripe of contrasting green, aran wool, leaving enough black to finish off the toe. I was really pleased with how my first three pairs of socks turned out and I can honestly say that I have also become an avid fan of the home made sock. Although I still consider myself a beginner, in the sock-making world, I will definitely be making more! Well what a great blog. I got really interested in knitting socks after reading this – thank you.